There are lots of events happening near Hopyard Farm. If you are considering a caravan or motorhome holiday with us when any events are taking place, we recommend booking early to secure your pitch! 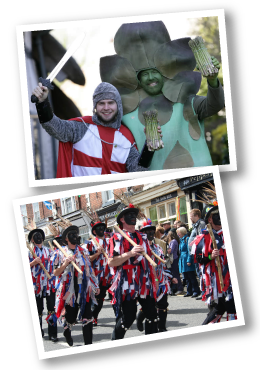 Asparagus related events and activities in the Vale of Evesham. Upton upon Severn Folk Dance and Song Society's Annual Festival held around the town of Upton upon Severn, Worcestershire. Be part of a Great British day out! A jam packed day of family entertainment and fun, all in celebration of our great British farming world and countryside. Jazz, jive, swing, boogie, comedy, dance, rhythm & blues in and around Upton-upon-Severn, Worcestershire. A weekend-long celebration of this glorious autumnal fruit with events and activities taking place throughout the town. A celebration of food, the countryside, gardening and nostalgia at the Three Counties Showground, Malvern, Worcestershire. To find out what else is happening in the region during your stay, please visit www.visitworcestershire.org/events. For details of events happening at the Three Counties Showground, visit www.threecounties.co.uk.